Do you know, these craft projects you see on the internet, Pinterest or Instagram over and over again and think everytime: ‚I need to try this too!‘ Yes, I think, you know what I mean. One of these marvelous projects was a string art picture for me. I stumbled over these beautiful pictures again and again and an idea for my own evolved in my head. Eventually in September I started to make it a reality. I bought a board, cut it into a square (30 x 30) and painted it white. Then I needed two to three attempts to sketch the pattern for the nails and strings in the right format and position the nails right, so they formed the perfect circle and integrated the two letters in the center at the right position. I think there are a lot of good tutorials out there, therefore I just want to share my lessons learned from this DIY with you. Maybe it helps, to prevent some mistakes I made for your project. as string I used embroidery yarn. There’s a big selection of colors and the yarn is wether too thick nor too thin for string art. when you paint the board, be sure to put something between the board and the paper to hold some distance. Otherwise the paint will stick between them and leave paper bits on the back of the board. 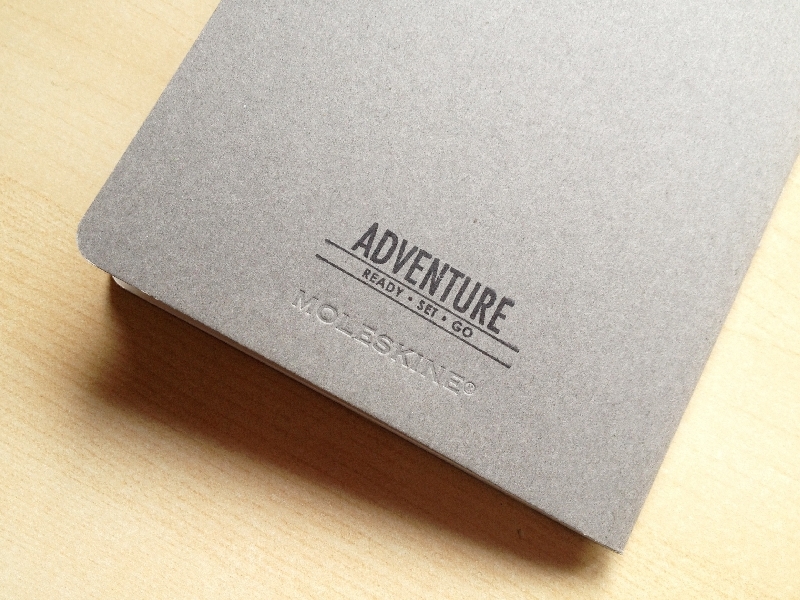 make a sketch on squared paper. It’s the most important lesson doing string art. I needed three attempts to get the sketch right and put the two letters exactly in the middle of the circle and find the right place for the nails to build the frame of the circle. So take your time and use squared paper. One centimeter (two squares) distance between two nails worked very well for me. the benefit of the sketch on paper is, you can fix it with tape on to the wood and hit the nails directly through the paper into the wood. Afterwards you only need to remove the paper. use nails without head. Although the string slips off much easier, it’s looks much better later on the finished picture, when you don’t look at the big circle heads of the nails. the nails shouldn’t be too long. Otherwise the distance between string and board will be too big. I choose nails in size 1.5 cm. before you remove the paper, you should mark the outline of your letters with another colored string. That way you know, where you are not allowed to cross between nails with your chosen string. keep the string on strain while you wind it around the nails, otherwise the string will get lost on the last few nails. if you want the string art looking straight and clean, you should think about the route to wind the string around the nails. Because if you do it as you go, it will look like mine, messy and far from perfect. pay attention to the parts, where the string must go along in any case. That’s the outline of the letters and the outline of the circle. If you forget a line inside, it’s not that important. But if you forget a line between two nails, that mark the outline of the letters or the circle, you will see it on your finished picture later, like you can see on mine. I forgot two lines at the letters. you have to try which direction is better to wind the yarn around the nail. It depents on the direction of the next nail. Sometimes it’s better to wind it clockwise and sometimes counter clockwise will secure it better. Bookmarks are something I never have around. For long times my boyfriend and I used paper scraps like bills to mark our reading process. Therefore I wanted to make bookmarks for us, to have something beautiful in hand while reading. For this bookmark I used three different kinds of washi tapes, all in red and white to be consistent, white cardboard, white ribbon and the beautiful little labels of Ormolu. I hand cut a paper card from the cardboard, taped three stripes of washi tape in the middle and two on the edge and taped the overlapping rest to the back. 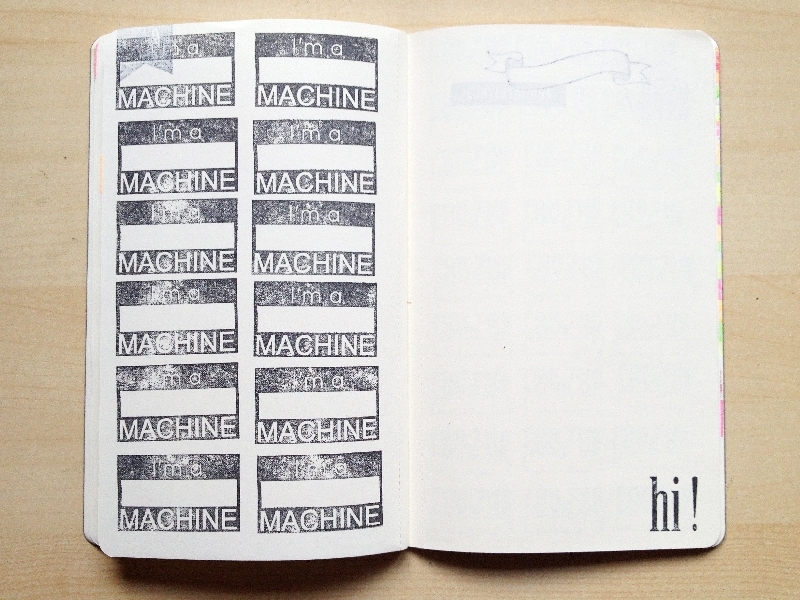 Then I cut one label out and used photo glue pads to attach it to the middle of the bookmark. To secure the ribbon, I punched a hole into the upper end of the bookmark with my Crop-A-Dile Punch (from We R Memory Keepers). Then I pulled the closed end of the double layed ribbon through the little hole and afterwards the open ends through the loop and pulled till it was fixed. Later I tied a knot in the open end of the ribbon, so the ribbon doesn’t hang loose. As final step I rounded the corners of the bookmark with my Crop-A-Dile – Corner Chomper Tool (from We R Memory Keepers). Hope, you are inspired to make a bookmark yourself. If you have any questions leave a comment. Time for a new notebook. My notebooks for my daily notes last about three months, then I need a new one. I make it a sport to create a one-of-a-kind notebook every time, like my travel journal and my favorite notebook with washi tape dots. 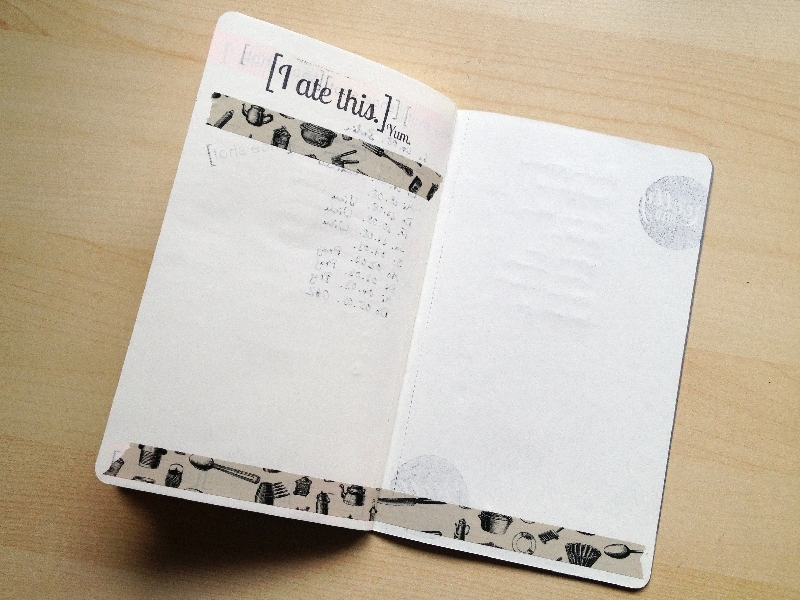 Therefore I take a regular Moleskine notebook and make it my own by using stamps, washi tapes and other crafty things. 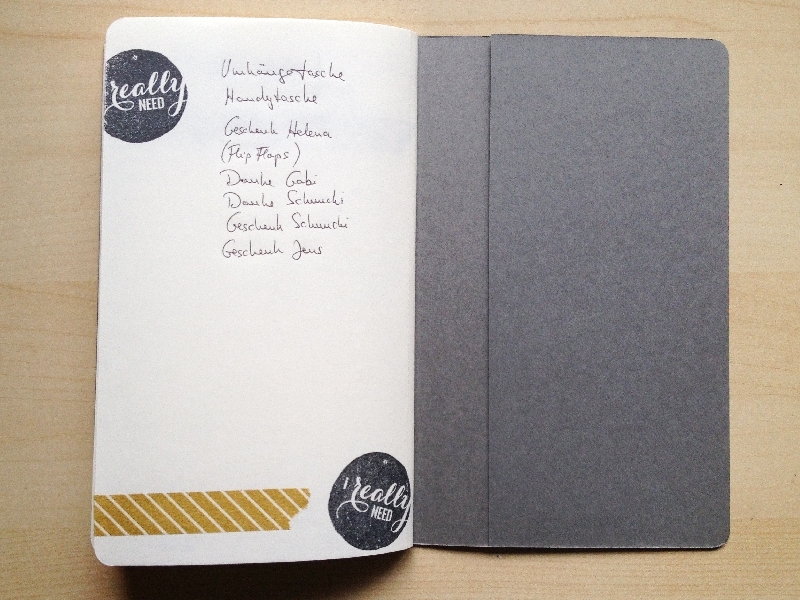 So here is my newest creation and the one I’m using at the moment: my little violet notebook. For the cover I used a Moleskine Cahier Journal in light violet (official Persian Lilac), silver lined washi tape, some stamps, a white stamp pad and a silver gel pen. 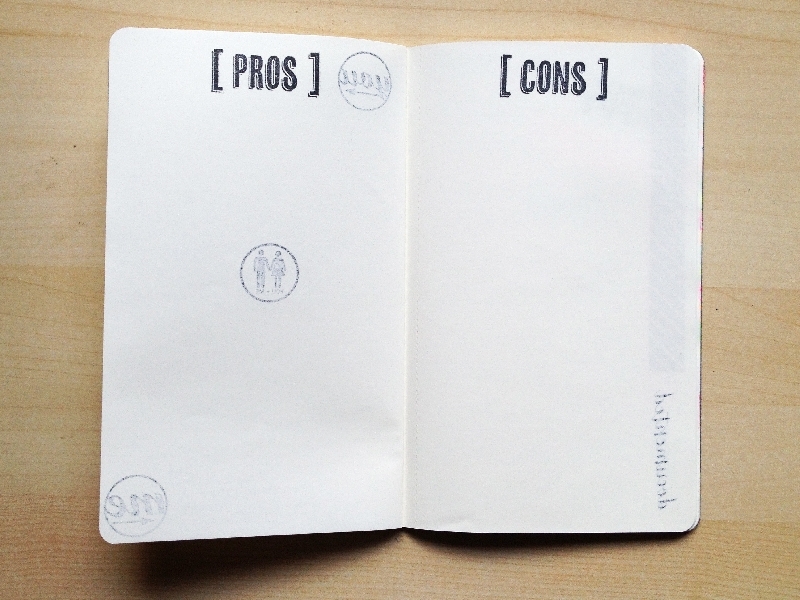 I stamped the whole cover and tried to align them from left to right but not down. At the bottom I had too few space left to stamp it again with the first stamp. So I chose two other and used them as an eye-catcher. 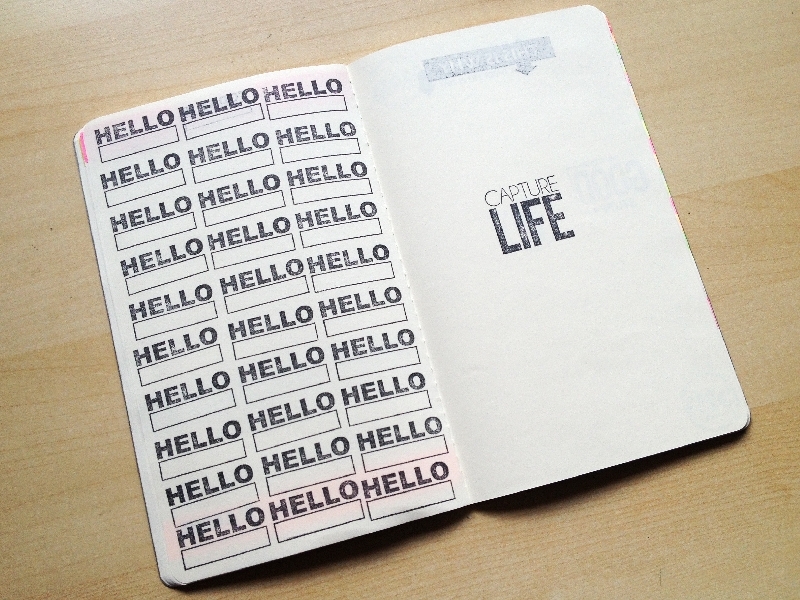 All three stamps belong to the rubber stamp set ‘Capture Life‘ by I lowe Scrap. I draw drop down shadows on one of the stamps in the center of the front cover with the silver gel pen and on the two stamps at the bottom too. 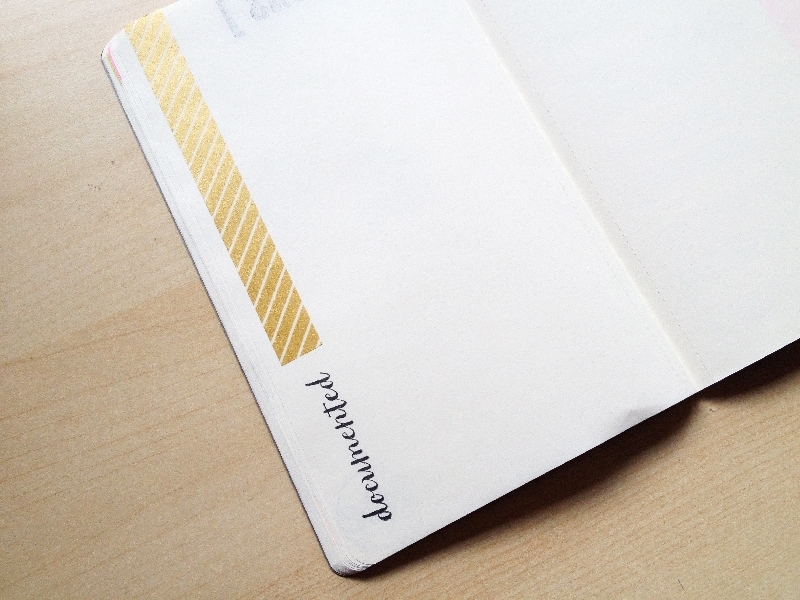 Then I used the silver lined washi tape to secure the edges and make the notebook look a little more classy. 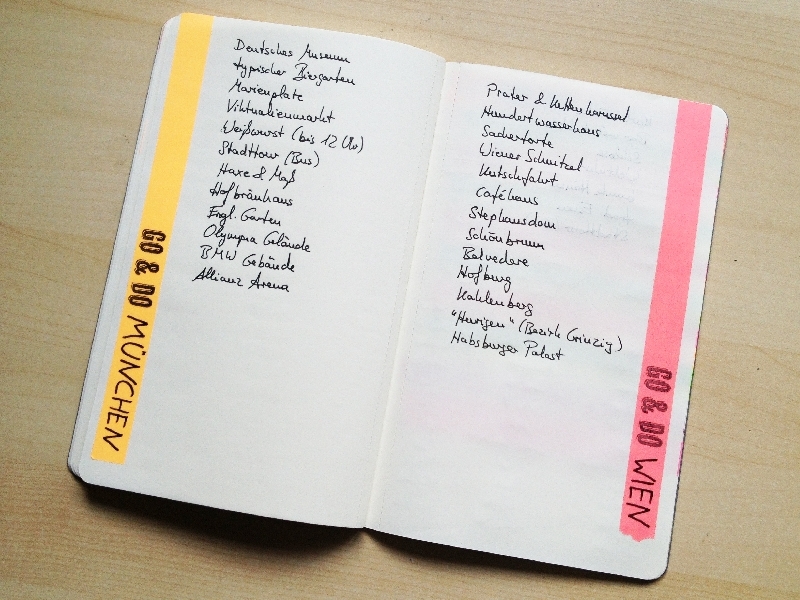 Because I need a lot of to do lists, I prepared them for about three months and put them on the first pages, so I have a better overview and can put things down, that are not due until four or six weeks later. 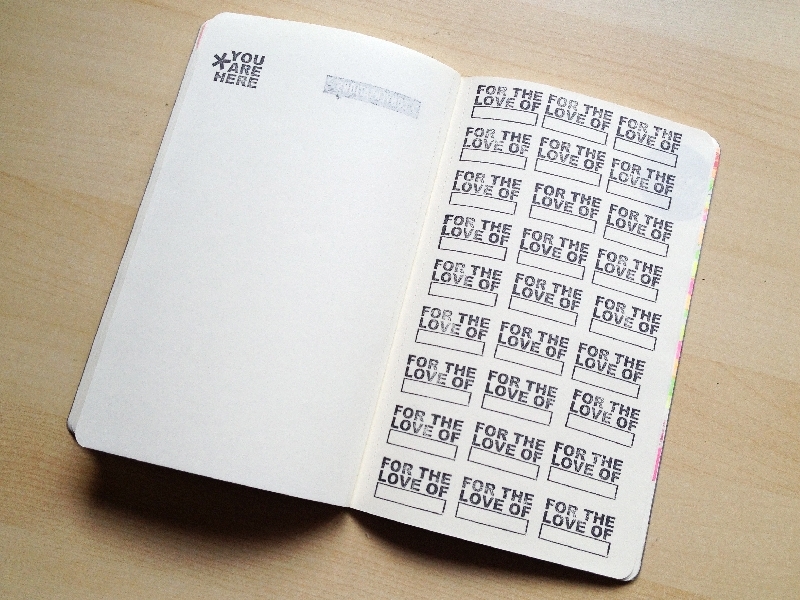 So I stamped the Go & Do stamp by Blinks of Life (sadly no longer available) on all pages, added the week and embellished the page with a stripe of washi tape. 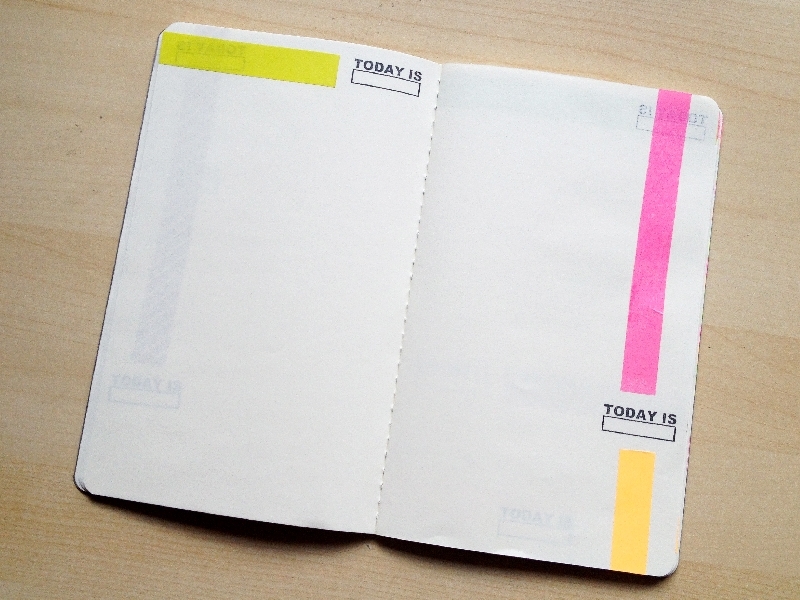 I love to work with this little notebook everyday, so shiny and colorful. If you are interested in more DIYs look over here. Like I promised last week, here is the DIY to make a simple and pretty box for the memory cards. 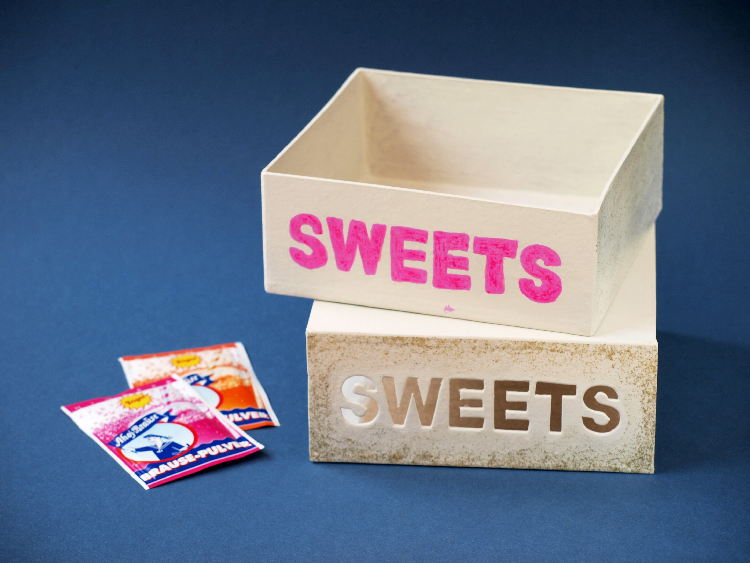 It’s really simple and you can manage to make this box in under 30 minutes. You need a cardboard (DINA3), the box of the blank memory cards (better are two – I will tell you later why), a pencil, a ruler, a cutter, some embellishments and pretty alphabete stickers. The first step is to disassemble the old box, that came with the blank memory cards. Do this by loosening the old glued parts really carefully. You need the whole cardboard as a pattern. So it should be as it was, before it was glued together for the first time. Then you take the disassembled box pattern, apply it to your new cardboard, draw around it and then cut it out. Be really exact with corners and angles. Otherwise you will have problems to piece them together later. Be sure to cut not too deep into the corners, because that way it will be more difficult to get the fold lines straight. Now you should use your ruler and your cutter to help you fold the side parts up like your pattern. You can do this by applying the ruler parallel to the fold line and draw with the edgeless side of the cutter along. 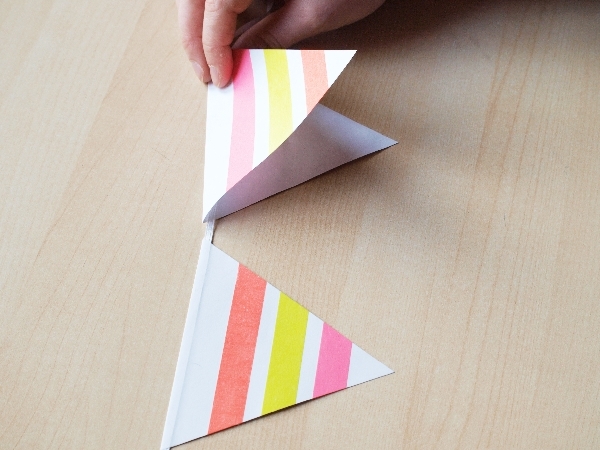 This way you don’t really cut the paper in two, but impress the fold line, so it will be a lot easier to fold. Use your pattern as a model, to look for the parts that must be folded. box by looking at the second, still complete box and to reconstruct which flap goes underneath and which above the other. When you rebuilt your new box, you can glue the parts together. Again, look how it was done on your model box. 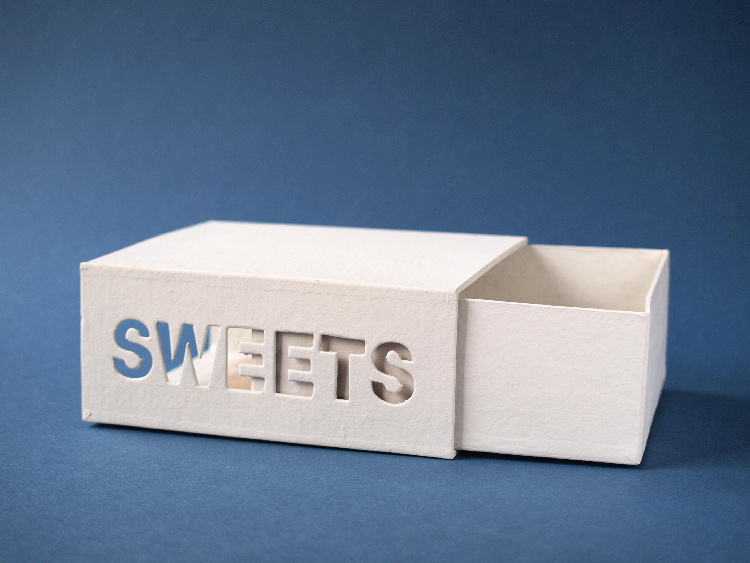 All you have to do then, is to embellish this little memory card box and then you’re done. With your memory cards you have now a pretty little gift for Christmas or a new colorful game for a rainy family afternoon. Last week I posted, how to make those pretty memory cards with washi tapes. 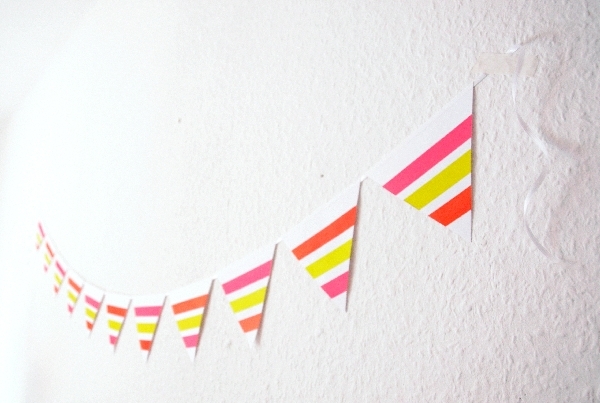 And here you can find more ideas for crafts, if you are a lover of washi tapes like me. Time to do some crafting. Maybe this is something you can make as a gift for Christmas or prepare it for a lazy game Sunday with the family. It is not only fun to play this game, but to make up your own patterns with all of your pretty washi tapes. All you need is a box full of plain memory cards, should be available in every bigger craft store and a whole lot of different washi tapes with pretty colors and patterns. Always take two plain cards and tape the same pattern on them. My cards were almost the perfect size, so that four stripes of tape fitted almost completely on the card. Cut the ends really close at the edges, so nothing overlaps. If you want to make this game a little harder, choose patterns that differ only in slight color shades or for example stripes, that are straight and cross in the same color. Thus it’s harder to tell the cards apart, when they are turned seperately. And you will most likely find it harder getting the right pair. 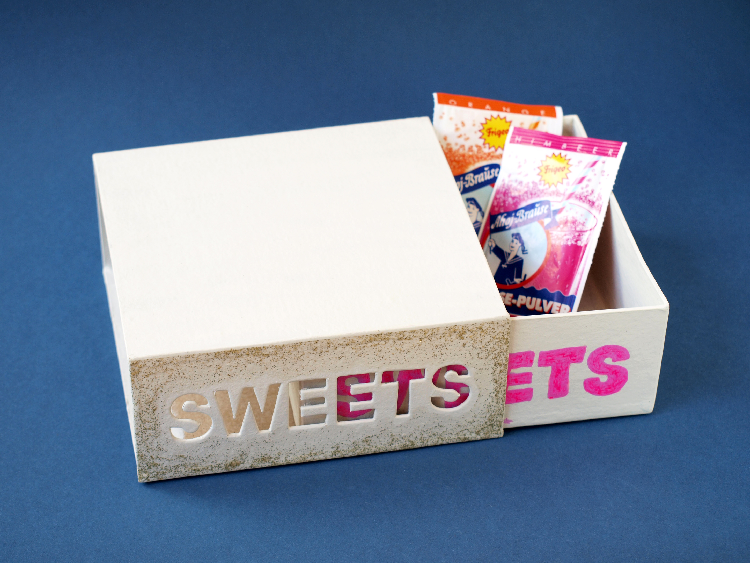 I will show you next week, how to make this pretty box for your memory cards. It’s very easy and quick. 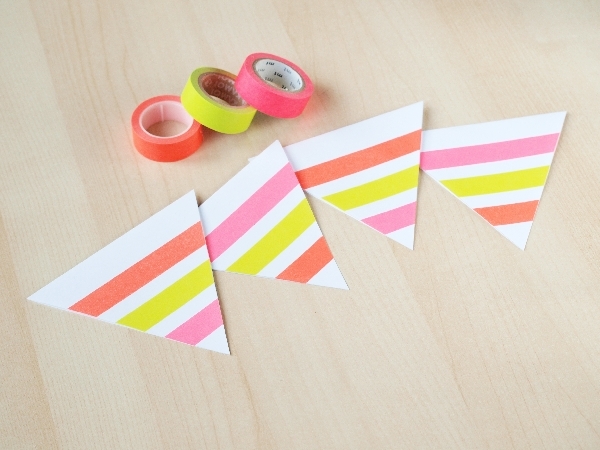 Here you can find my other crafty ideas with washi tapes. 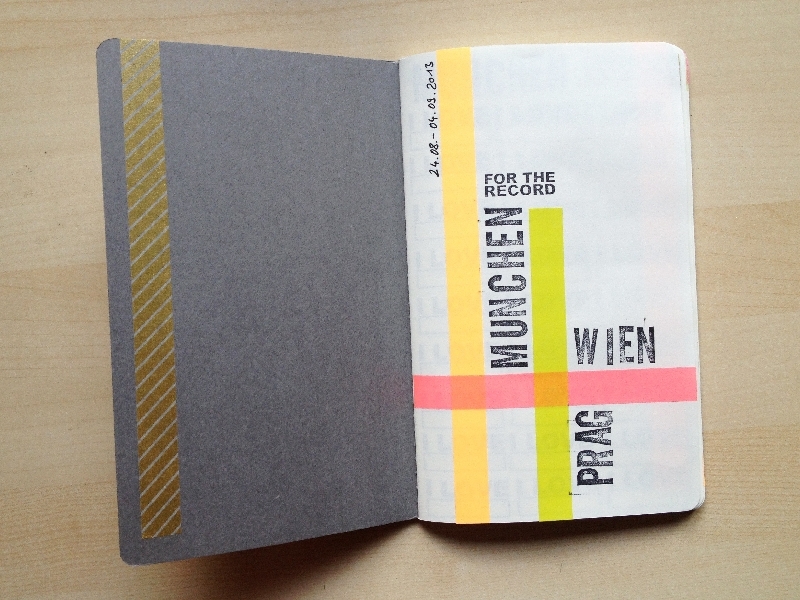 When we planned our vacation from Munich to Vienna and Prague, I knew, I wanted to document it. 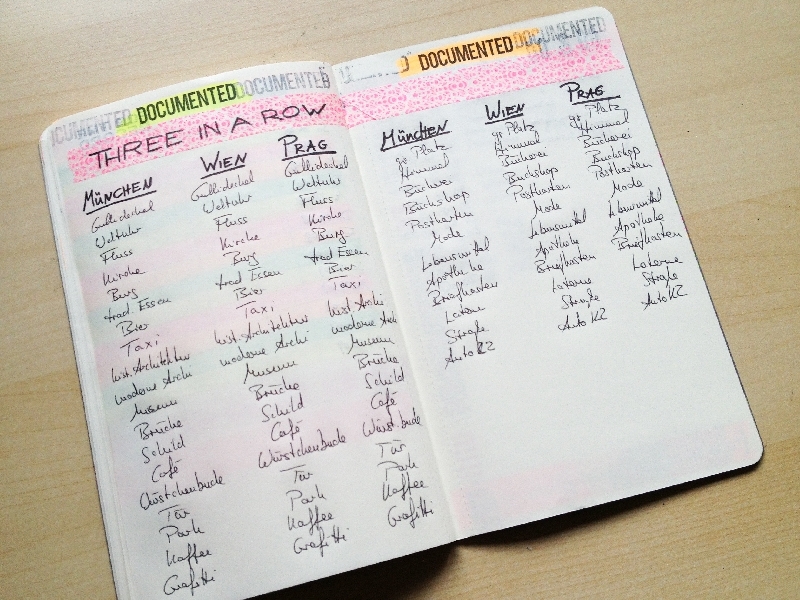 Because I didn’t just wanted to write a travel journal the regular way on empty, boring pages, I prepared a Moleskine notebook with my beloved stamps and washi tapes. This way I was forced to think about little things too, like what I liked about a city most, that otherwise would have been forgotten. 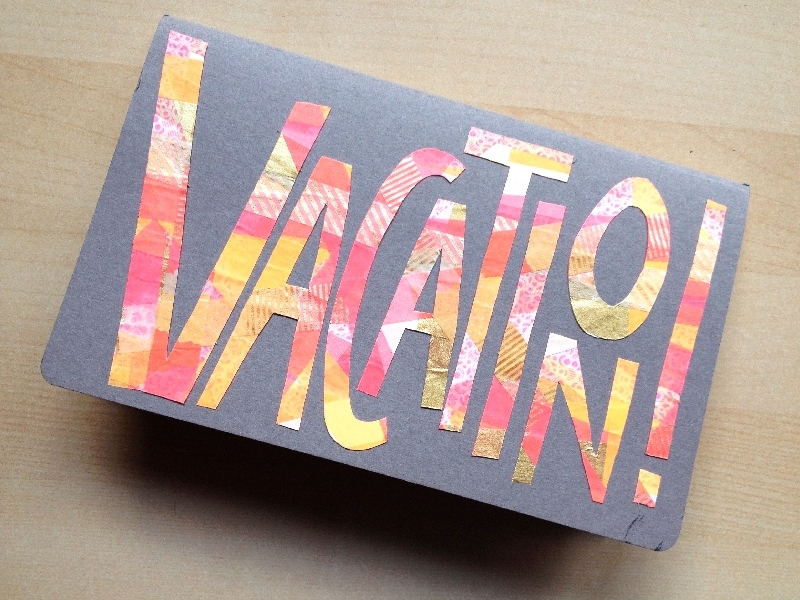 For the cover I took many different washi tapes, stuck them over each other in different angles and cut the word ‘vacation!’ out. I saw this technique over at Whimseybox created by Alicia Dirago. 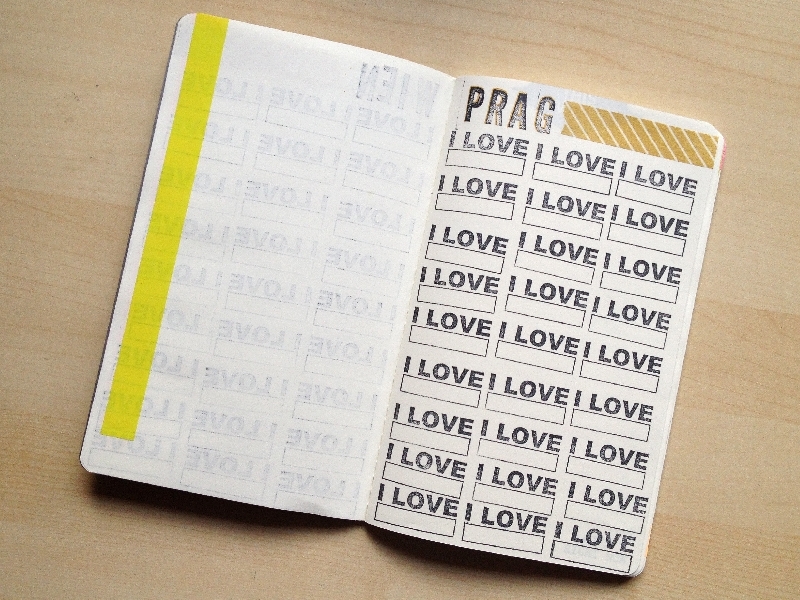 Loved her typographic washi tape art so much, so I thought, it would be fun to make something similar for this little notebook. On our last day in Prague, we sat in a beer garden and discussed the pros and cons of our way of traveling and what we loved and hated about the cities in particular. It was fun to see the different opinions. Furthermore I prepared some pages with To do-lists for gifts, sightseeing spots and some photo projects, to keep track of all the ideas. 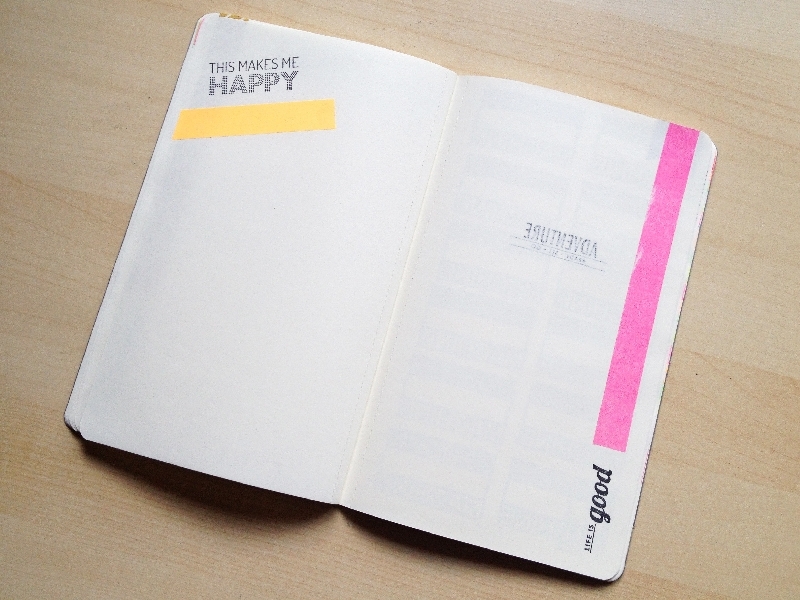 It was very helpful to have this notebook at hand and filled it, whenever I had the time. For this travel notebook I used the lovely stamps of Elise Blaha, Evalicious, Bananafishstudio, Amanda Rose, Amy Tangerine, I lowe Scrap and Blinks of Life along with some washi tapes. And if you’re wondering… yes, I have a really big collection of wooden mounted rubber stamps. It was so much fun, to use them for this little project. 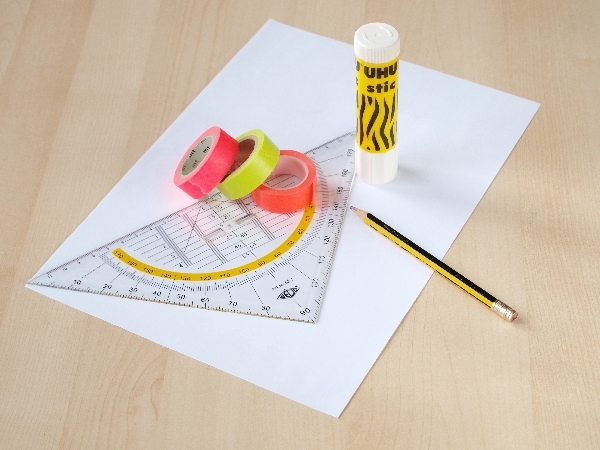 The supplies: three types of tape – I used pink, orange and green neon washi tapes, white DINA4 paper, glue, a white ribbon, a set square und a pencil. That’s it. 1. 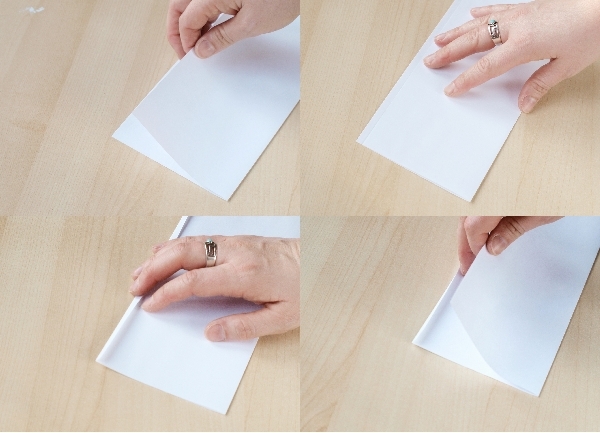 At first you fold the paper lengthwise a little bit over the half. Then you take the little rest and fold it over again and glue it to the back of the folded paper. This way you get two closed sites. Turn the paper around, so the unglued side is up. 2. Then you draw triangles on the side without the little folded edge. With help of a set square you get triangles of the same size and width. I used the angle 75°, this way I got four triangles. 3. 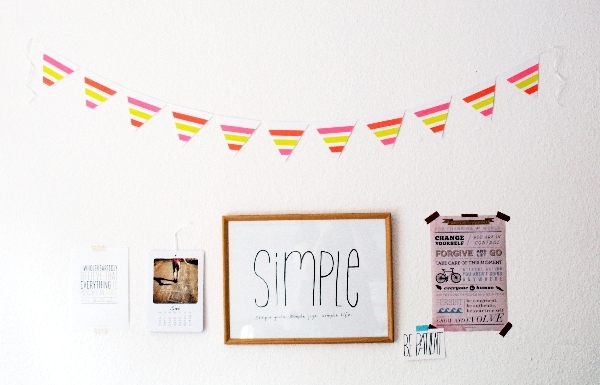 After you drew the lines, you can simply tape three washi tape stripes parallel to the long side of the paper. A little tip: If you tape the outer two washi tape stripes first, it’s easier to find the perfect middle position for the last tape. 4. The next step is to cut out the triangles. 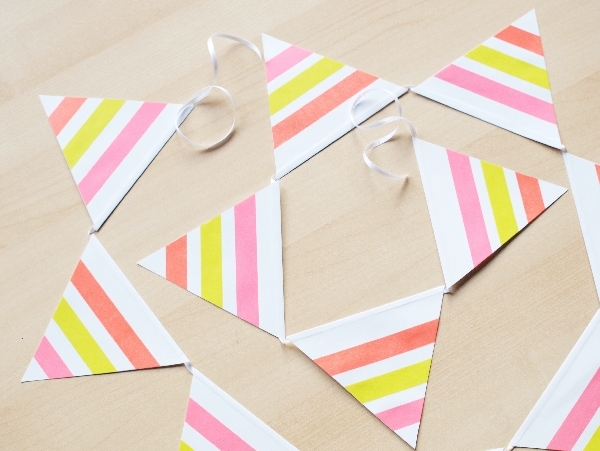 Repeat the steps 1.-4. at least two times so you get 12 triangles, better more often, so the garland will be longer. It depends on how long you want your final garland to be. 5. When you have enough triangles, you take the white ribbon, position it inside the triangles and then glue the triangles close. If you want to know, how this step works more closely, look over here. And that’s it. The garland is finished and can immediately be used as decoration. 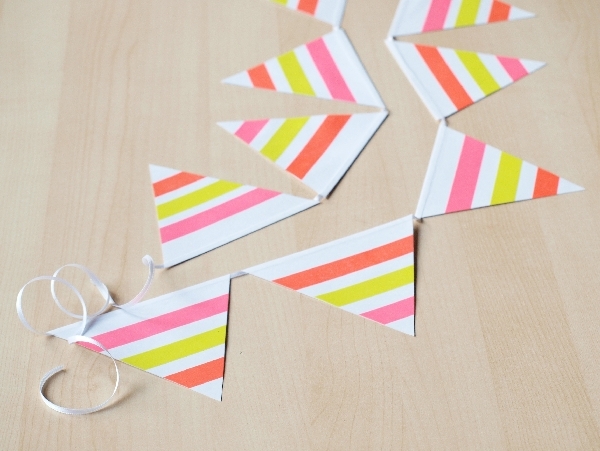 Have fun creating your garland in your own style. It’s perfect for different tape combinations. Are you a sweet tooth like me? 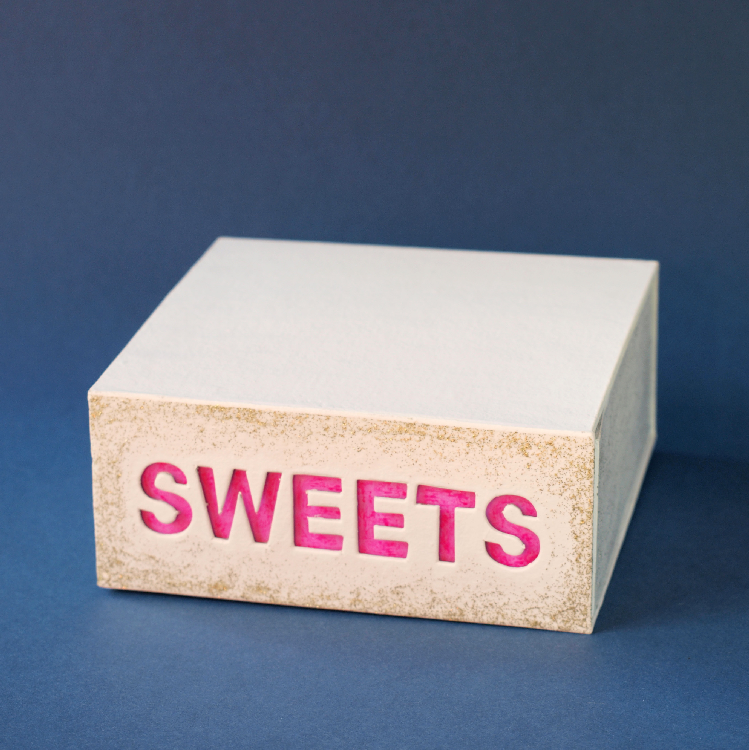 Our cupboard is so stuffed with sweets, that I don’t find anything, when I want something. Then on my last visit at our local craft store, I found this cardboard box and was instantly inspired to this little DIY. 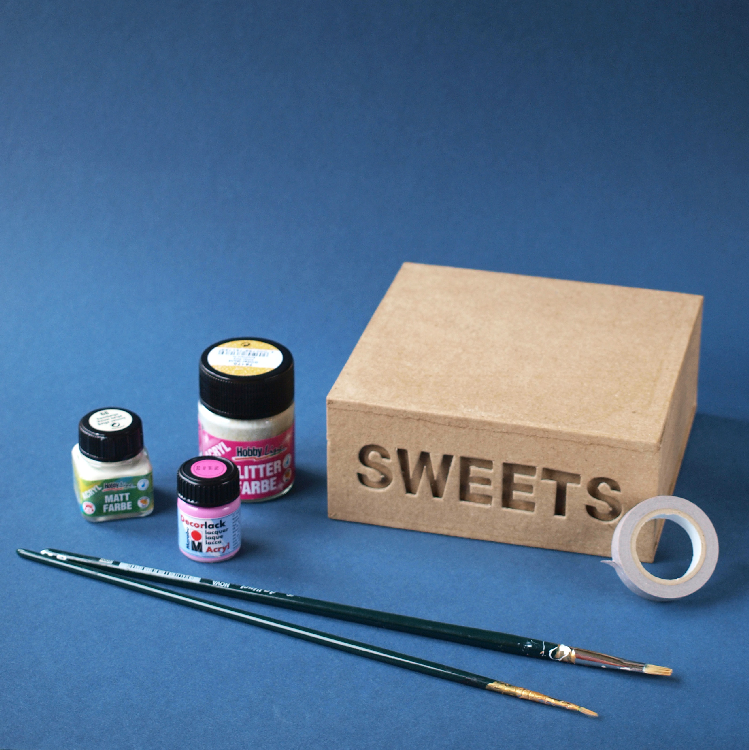 All you need is a cardboard box with a cutout word, some acrylic paint and one or two good brushes. I bought matt white, neon pink and gold glitter acrylic paint. 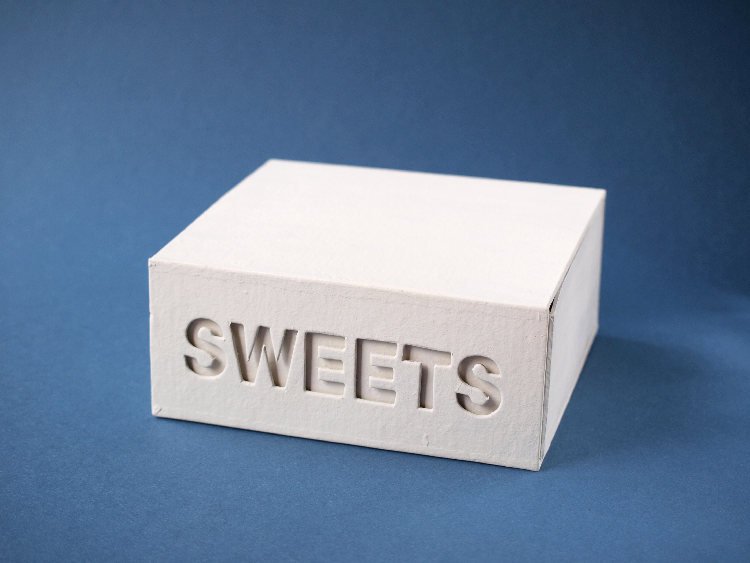 First I painted the box inside and outside with a matt white acrylic paint as a ground coat. I used the wider brush to be faster. Then I let it dry for a while, before I proceeded. 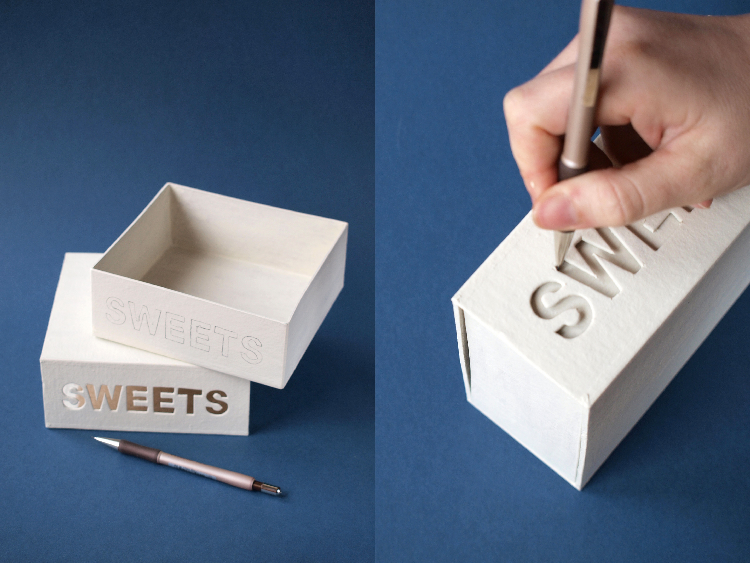 Then I put the drawer inside the cover and traced the inside of the letters, to know exactly where to paint the word. It’s good to adjust the drawer in the middle of the cover and position the whole box with the opposite site on the table, so you have a resistance, when you trace the letters. Afterwards I painted the letters in neon pink and a little wider to make sure the cutout word will be filled, even when the drawer isn’t exactly in the center of the cover. To make the box a little special I used the gold glitter acrylic paint for the sides of the box and and the front. Here I tried to paint a gradient – with less glitter in the middle and increasing glitter to the edges. The paint is gorgeous, because it’s only glitter without any color paint. So you can use it on any other ground coat. If you have any questions on this DIY or any other post, please leave a comment.